I thought Pirates of the Caribbean: On Stranger Tides was a hundred and thirty-seven minutes of silly pirate fun. It missed some of the magic of the PotC: The Curse of the Black Pearl and lacked some of the elements that sustained PotC: Dead Man’s Chest and PotC: At World’s End. However better than some of the reviews I’ve seen that would suggest it was a far worse film than it is. The big problem all the sequels to the Pirate of the Caribbean film have is that they will be compared to the hit that the original Pirates of the Caribbean: The Curse of the Black Pearl was. You’re never going to be able to recreate the impact of seeing Johnny Depp’s Jack Sparrow for the first time. On Stranger Tides starts out well Jack impersonating a Judge could have been played for more laughs but that would have slowed the narrative down. We’re quickly treated to Jack’s cracking escape sequence followed by Keith Richards appearance as Captain Teague and the cracking fight between Jack and Angelica’s impersonation of Jack. Jack is Shanghaied by Angelica aboard Blackbeard’s ship we get into the meat of the film’s plot. Everyone is off to sea in a race between three competing sides to get to the Fountain of Youth first. We have the Revenge with Blackbeard, Angelica, Jack and the missionary Philip against Pirate turned English Privateer Barbossa against the Spanish king’s expedition. After fighting with mermaids, trekking through jungle, looking for a pair of chalices on a ship loaded with gold balanced on a cliff edge which should have had [Micheal Caine] aboard to say “hang on lads I’ve got an idea”, extracted a tear from a mermaid and had an encounter with the Spanish we get to the climax at the fountain. Here we have a series of battles followed by a moral dilemma and a cliché that had been sitting around waiting to happen ever since Angelica explained the ritual earlier in the film. The film wraps up leaving the surviving characters in various situations from which any and all of them can return for future instalments depending on the availability of the actors. My biggest one is that opening cracks along so nicely then once we leave the merry old England of Richard Griffiths’ King George the pace slows down a bit and never recovers. The plot didn’t create any urgency to the rush to the fountain. Blackbeard has the prophecy of his death, the English are trying to get there to claim it before the Spanish, Barbossa hopes to find Blackbeard there to take revenge and Jack’s interest has been set up in the earlier films. Ironically the one thing that could have been used to add pace, the Spaniards intention of destroying the Fountain of Youth, wasn’t revealed and instead was used as a bit of a damp squib twist at the end. Had we known their larger, better equipped expedition was going to destroy it everyone else would have had a reason to rush to get their first. The Spaniards’ were one of the film’s two missed opportunities. The second missed opportunity was the relationship between Syrena the Mermaid, and Philip the missionary. Rather than being the new Will Turner and Elizabeth Swann they were relegated to being the plot mechanic to get a mermaid’s tear. Had Philip been more of a firebrand, possibly establishing the Spaniards’ religious intention to destroy the Fountain as a profane artefact, torn by his love for an inhuman mermaid he could have been a far more interesting addition to the film. Instead we got a rather bland, more tea please, stereotype who stripped from the waist up presumably to provide some eye candy for the fans saddened by Orlando Bloom’s absence. Blackbeard could have been a bit more villainous, a bit more irredeemable and could have made more of his swords power. With Jack and Barbossa around Ian McShane needed to turn his performance up to 11 where as it was sitting around at an 8 or a 9. His zombified, mystic henchmen also lacked something – they weren’t up to the skeletal pirates of the first film or even the fish men hybrids of the second and third. My last quibble is that the final battle just didn’t pay off. I’m not sure why not but it just lacked the energy of the opening. If it had it could have redeemed the films other flaws. Jack Sparrow and Angelica had a real spar. At times their chemistry lent towards being Carry on up the Caribbean with a high level of double entendre which fortunately really worked to establish them as a former couple who still have a spark. It was a good idea to pare down the number of characters from the previous films, a few more cameos from smaller parts amongst crews might have been nice but losing lots of the bigger characters gave this story room to breathe. The old relationships that remained between Jack, Barbossa and Gibbs all worked well. As a Vue user it was really nice to see some top-notch landscape work with Vue. I really couldn’t see the joins between virtual and real landscapes. I may be wrong but I don’t think it was just spectacular jungle backdrops that had been produced in Vue this time but also I think some really nice rocks, cliffs and possibly a few cloudscapes might have too. 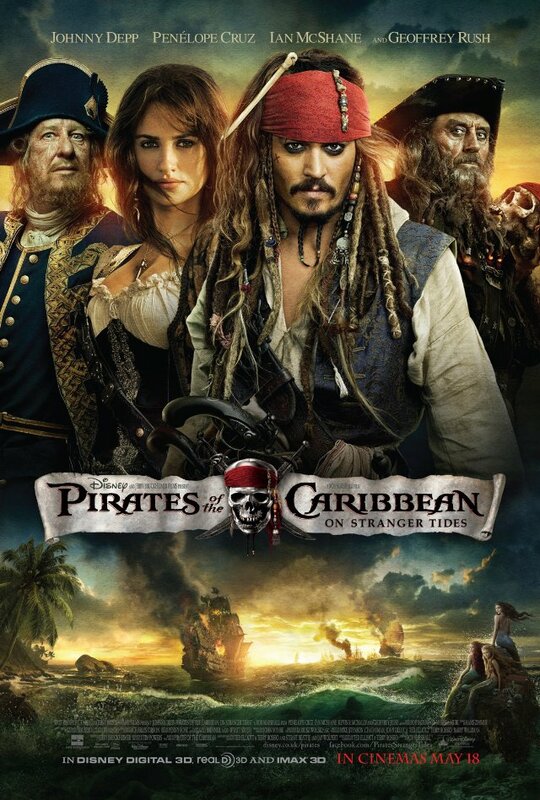 So overall I thought Pirates of the Caribbean: On Stranger Tides wan an enjoyable, Friday night, popcorn pirate movie.